Shoeing the draft horse can be intimidating, if only because of these magnificent beasts' massive size and formidable strength. But you'll gain new confidence with the help of Scottish farrier Edward Martin, the world's No. 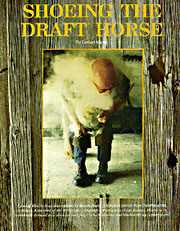 #1 draft horseshoer. You get two dozen color photos and plenty of tips that cut this job down to size.